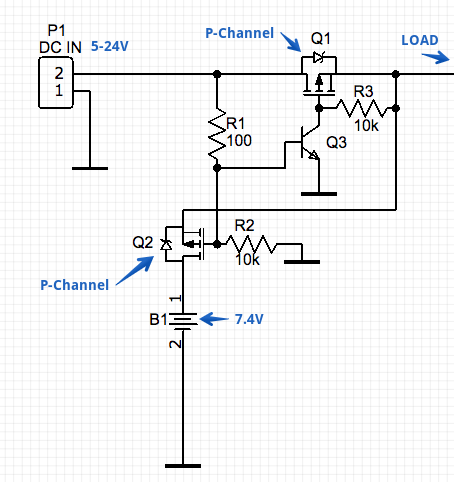 I need a circuit which will automatically disconnect the battery from LOAD when ext. DC power is connected so that the battery won't get damaged. Q1 Is preventing battery from discharging to DC IN when e.g. 5V source is connected and isolating DC IN positive wire from battery, so we can detect a ext. power supply is connected. Q2 Is preventing DC IN 9-24V from going to battery and damaging it. But probably a small amount of current will flow thru Q1's body-diode to battery at first moments after ext. power is connected (or contact bouncing) before Q2's gate has triggered, but I'm not sure if it's something to worry about. No diodes at load current flow please, since 0.4V@6A is 2.4W of heat and ~5-6% loss in efficiency (which is bad for a battery-powered device). 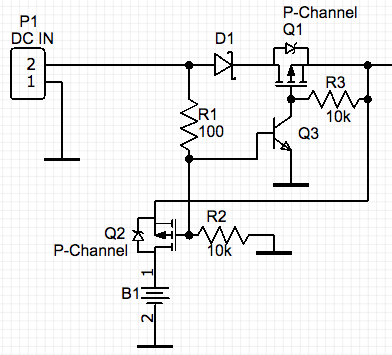 Or, if first circuit seems to work just fine and there's no significant errors I made, maybe I can use it? Thanks for help! Q1 and Q2 function as a differential pair — when one is conducting, the other is cut off. Not the answer you're looking for? 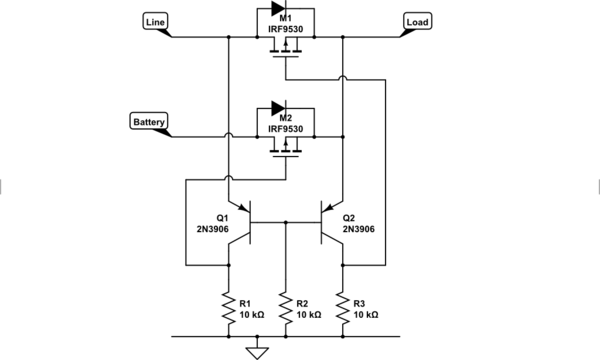 Browse other questions tagged voltage mosfet switches analog dc or ask your own question.